Our organization is dedicatedly engaged in the business of offering a wide gamut of Gauze Swab. These swabs are manufactured at our vendors base using high quality absorbent cloths which we source from reliable vendors of the market. 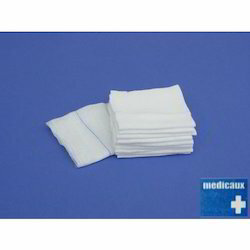 All the gauze swabs offered by us are widely used in hospitals and nursing homes for dressing of wounds. Further, clients can avail these swabs in various shapes, sizes and other specifications as per the requirement of our respectable clients. Looking for Gauze Swab ?